Berberine – a yellow-colored alkaloid compound found in several different plants, including European barberry, goldenseal, goldthread, Oregon grape and tree turmeric – has antibacterial, anti-inflammatory, antiproliferative, antidiarrheal, antineoplastic, antidiabetic and immune-enhancing1 properties. It has a long history of use in traditional medicine, including traditional Chinese medicine, and many of its historical uses now have scientific backing. For example, it’s effective against a wide range of bacteria, protozoa and fungi, and is commonly used to treat gastrointestinal issues, including traveler’s diarrhea and that from food poisoning. Having similar mechanisms of action as the drug metformin, berberine can also be used as an oral hypoglycemic for Type 2 diabetics. Produce results in clinical trials in improving Type 2 diabetes on par or better than conventional drugs including metformin. Improve blood lipid levels better than statins. Lower blood pressure in many subjects as well as any class of antihypertensive medication. Improve liver function and promote anti-obesity effects. Exert significant beneficial effects on digestive health and the microbiome. What Makes Berberine Such a Powerful Remedy? AMPK is also an important neuroprotector. As explained in the Journal of Neurochemistry,8 “AMPK senses metabolic stress and integrates diverse physiological signals to restore energy balance. Multiple functions are indicated for AMPK in the [central nervous system] …” Berberine also benefits brain health and psychological well-being by increasing key neurotransmitters. A number of studies have demonstrated berberine’s usefulness against anxiety and depression, in part by inhibiting monoamine oxidase, an enzyme that breaks down serotonin, noradrenaline and dopamine in your brain. These neurotransmitters play important roles in mood and have been implicated in depression. A similar study by South Korean researchers found berberine was helpful in treating post-traumatic stress disorder (PTSD). As in the Indian study, rats exposed to prolonged stress exhibited significantly reduced anxiety-driven behaviors after receiving berberine. They were also better able to complete complex navigational tests. 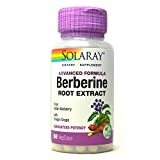 While berberine is quite safe and well-tolerated, it may be contraindicated if you’re taking medications.21 For example, berberine may hinder absorption of tetracycline and other similar antibiotics, rendering them ineffective. Also, because berberine significantly inhibits CYP3A enzymes – enzymes needed to metabolize most drugs – it can lower the clearance of medications, which in turn can augment their effect. This can lead to overdose, the risks of which will vary depending on the drug in question. Berberine inhibits CYP3A just like curcumin, which impairs phase 2 detoxification, where your body makes toxins water soluble so they can be excreted. So, this would not be supplements to use during fasting where you have large lipolysis and liberation of stored toxins that need to be metabolized. 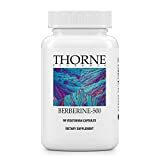 Because of all its benefits, I have been taking berberine for over two years. However, because it is a potent alkaloid, I believe it needs to be cycled. So, I take it for a week then take a week off. Alternatively, you can skip it on the weekends. The general principle is cycling, just like one does with the ketogenic diet. It is not wise to be continuously ketogenic. Also, as noted by Murray:22 “Berberine … enhances the effects of oral hypoglycemic drugs used in the treatment of Type 2 diabetes through its multitude of antidiabetic effects. People on oral hypoglycemic drugs should monitor blood glucose levels if taking berberine and adjust their dosage of their medications as needed and under the care of a medical professional.” I tell virtually everyone taking metformin to switch to berberine as it is far safer.